SRLP is offering a great 2013 calender, I just got one and its beautiful. You can order one here. This calendar was designed using the artwork of SRLP’s Prison Advisory Committee (PAC) members andcollages by artist, Caroline Paquita. As PAC members are housed in New York State detention facilities, artists use whatever limited materials are available to them. Often we receive drawings, poetry and doodles on used envelopes, lined paper or on corners of manila folders. Even while existing in some of the most violent and isolating conditions, members of PAC (like so many oppressed communities) continue to find ways to survive, resist and break down the distance and physical barriers created to systematically divide our communities. 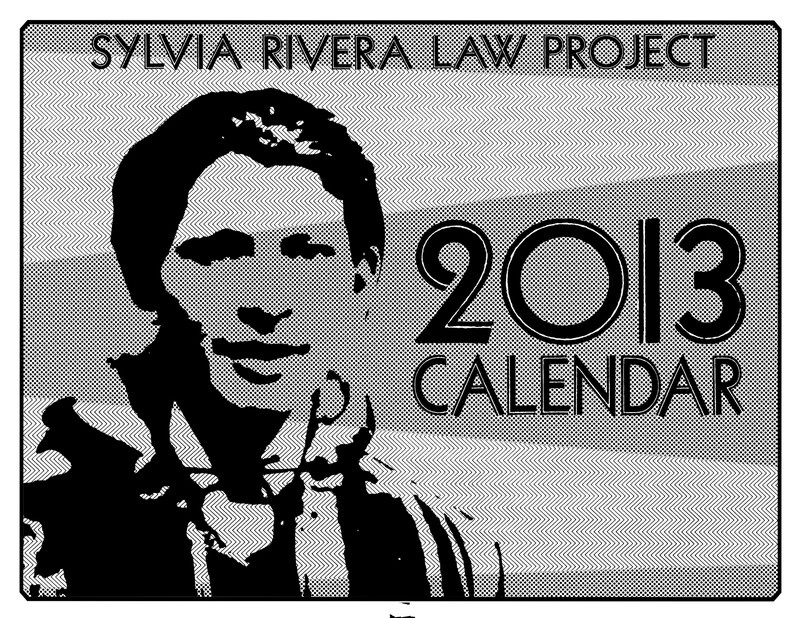 This calendar was designed to raise funds to support the ongoing work of SRLP and to extend the reach of PAC. It was also created to expand our historical knowledge, honoring those like Sylvia Rivera who never stopped fighting for us. This essay reviews three recently published books that stand at the intersection of queer/trans studies and critical prison studies. These books show the multiple and complex ways that queerness pervades the US prison system and the devastating effects of criminalization and incarceration on queer, gender- and sexual-nonconforming, and LGBT people. The author argues that this scholarship also demonstrates the need for queer and trans studies to engage with the US prison system and for critical prison studies to use queer analytics and examine the incarceration of queer and LGBT people. David Gilbert, a political prisoner and author of Love and Struggle: My Life in SDS, the Weather Underground, and Beyond wrote a great review of Captive Genders called “Transforming Society.” The review originally appeared in Critical Resistance newspaper, The Abolitionist and is available online though Social Text’s webpage here. Thursday October 4, 2012 5:30-6:30 PM informal book reception and Q/A with Eric A. Stanley for Captive Genders at Rainbow Bookstore Cooperative, Madison, WI tell your friends pretty please! Here is the fb page for the event. A panel with Eric Stanley, Dean Spade, Ralowe Ampu, and Vikki Law at the Law and Disorder conference in Portland, OR. There is a really important new issue of the journal Social Justice out on “Community Accountability: Emerging Movements to Transform Violence.” It includes a great review of Captive Genders by Queer (In)Justice co-author Andrea Ritchie, but the whole issue is worth a read. You can read the issue here. Also, a bit of an interview I did with Yasmin Nair and Ralowe Ampu is now translated into Spanish, you can read that here. We are planning to do a few more Captive Genders events this fall in Canada and Southern California. Teaching Captive Genders in a class or reading it in a group this upcoming year is a great way to support the book and help build our collective abolitionist analysis. Fearing an even worse outcome, CeCe McDonald took a plea deal yesterday, but the fight is far from over. She will need support (letters, money and more) for her time inside and for her reentry. We must also continue to demand her freedom now as part of our abolitionist struggles. You can read Reina Gossett’s reflection here and you can get CeCe’s address and other updates on her case here. Original Plumbing magazine just published Bryn Kelly’s really beautiful review of Captive Genders written though the struggle to free CeCe. You can head the review here. Also, the journal Postmodern Culture published “Entangled Spheres” another insightful and generous review of Captive Genders by Jian Chen. You can read it here. AK Press has a new website and for the month of May you can get Captive Genders for 25% off if you order through them. We will be starting our online fundraising drive to get Captive Genders to folks inside for free. Look for that soon. Captive Genders is an exciting assemblage of writings -- analyses, manifestos, stories, interviews -- that traverse the complicated entanglements of surveillance, policing, imprisonment, and the production of gender normativity.